Arbitration is a voluntary agreement by two or more individuals and/or entities under the express terms of a contract or otherwise to submit a claim or issue of disagreement to a neutral third party for binding decision. Mediation is a process whereby the parties voluntarily agree to submit their dispute and/or disagreement to a neutral third party in an effort to settle the matter in lieu of a lawsuit and/or litigation. An Arbitrator’s decision is legally enforceable. An Arbitrator is vested with powers comparable to that of a Judge. In Mediation, the Mediator is the facilitator, meaning a person who tries to bring the parties closer to settlement but has no legal authority to make a binding decision or to enforce his/her decision. Can you explain the Arbitration process? That is a broad question. An Arbitration proceeding can be formal or informal. There are Arbitration Associations which have rules and procedures for the conduct of Arbitration hearings. Generally, in Arbitration, the parties select an Arbitrator and are bound by the rules and procedures that govern the administration and management of the case. The parties to the proceeding submit evidence and proofs to support their case to a neutral Arbitrator who makes his decision based on the information provided to him or her. 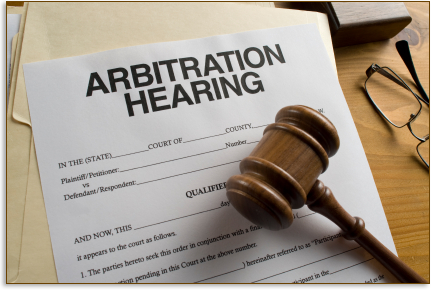 Upon conclusion of the Arbitration Hearing and receipt of the Arbitrator’s Award, the outcome can be enforced by either party in a Court of law. Anyone can be an Arbitrator. Generally speaking, an Arbitrator is an individual with experience in the subject matter of the Arbitration. He or she generally has an enhanced understanding of the technical issues and information related to the subject matter being arbitrated. An Arbitrator must be neutral of conflicts. However, absent that, there is no requirement that an Arbitrator be an attorney or any licensed background professional, unless mandated by the Arbitration Association. Is a Binding Arbitration Clause Found in Many Contracts and Documents Enforceable? Yes: New Jersey Statutes as well as New Jersey case law have specifically held that binding Arbitration clauses are enforceable and parties must submit their dispute to an Arbitrator for final decision. An Arbitrator is generally selected by the parties involved in Arbitration. Often times, a list of qualified individuals willing to serve as an Arbitrator are provided to the parties and their counsel if represented. The parties can stipulate an acceptable Arbitrator. If the parties cannot agree on an Arbitrator, then the Arbitration Association will select an Arbitrator. Where are Arbitration Hearings held? Hearings are generally held at the location of the Arbitrator but not always. If the parties stipulate to an Arbitration location the same will control the place of the arbitration hearing. Further, if there is an agreement that mandates Arbitration, the location specified in the Arbitration clause will generally control absent unique circumstances. What does the term Arbitration Award mean? An Arbitration Award is the final decision of the Arbitrator. It is the equivalent of a Judgment rendered by a Judge or a jury. It is the findings of fact and conclusions of law made by the Arbitrator which is enforceable. Is an Arbitrator’s Decision legally binding? You bet it is binding. It is legally binding on all parties to the Arbitration. While an Appeal of an Arbitrator’s decision can be made there are limited grounds to successfully reverse an Arbitrator’s Decision. Experienced legal counsel is necessary to evaluate the probability of successfully appealing the Arbitrator’s decision. How does the Arbitration Appeal process work? A Notice of Appeal must be filed with the Superior Court Clerk in New Jersey following the Arbitrator’s Award. Thereafter, the Court will establish a briefing schedule as well as a hearing date for the parties to appear and argue why the Arbitrator’s Award should either be reversed, confirmed or modified. Are there rules that govern Arbitration Proceedings? If so, where are they and where can they be found? There are a number of Arbitration Associations which have established detailed rules and procedures for the conduct of Arbitration proceedings. Several better known associations are the American Arbitration Association, Endive, National Arbitration Forum. Each association has created separate rules and procedures based on the subject matter of the Arbitration, for example, construction arbitration cases have rules from consumer fraud cases which differ from employment rules cases, etc. These rules and procedures are published on line and are available on the websites of each association. Litigation in the traditional sense involves attorneys, a judge and elaborate court rules, procedures and evidence. Arbitration is less formal and is generally managed by a single arbitrator though there are occasions when multiple arbitrators are required to decide the case. In traditional litigation there is the potential for significant motion practice as well as discovery proceedings that precede either a jury or non-jury trial. In Arbitration, the Arbitrator in conjunction with the parties and their counsel defines the scope of discovery and motion practice in a much more expedited and simplistic manner. As a consequence Arbitration hearings are generally scheduled within six (6) months but not later then a year from date of original filing. The parties can, however, agree to be bound by whatever formalities they choose including the New Jersey Rules of Evidence and the New Jersey Rules of Civil Procedure. Does New Jersey have laws that govern Arbitration? Yes, New Jersey has adopted the New Jersey Uniform Arbitration Act, a series of laws which are intended to govern Arbitration in New Jersey. These statutes can be found at N.J.S.A.2A:241et seq. In addition to statutory laws New Jersey has a long history of case law which interprets the statutory law(s) as well as issues which are not expressly covered by the statutes. These cases are available on line through a number of resources. Generally, Arbitration hearings are scheduled and decided within six (6) months to one (1) year of the date of the initial filing for Arbitration. Sometimes these cases can take longer then one (1) year but generally not very often. Arbitration Hearing can, however, be conducted and finalized within several months of the initial filing. Arbitration costs are determined in large measure under the rules of the various Arbitration Associations. There is a schedule of fees and charges that are listed on each association website and are generally based on the value of the case. If the parties can voluntarily agree to private Arbitration, in lieu of an Arbitration by an association, these fees are not applicable. The Arbitrator’s hourly rate is established by the Arbitrator at the beginning of the proceedings and is jointly shared by the parties to the Arbitration. Fees can be as low as several hundred dollars per hour to several thousands of dollars per hour depending on the complexity and the nature of the Arbitration. Construction related Arbitration cases and complex litigation cases generally incur significantly greater costs and expenses then consumer or other less complex matters. How do I know whether my case is subject to binding Arbitration? This question can be answered quite simply. If there is a binding Arbitration provision in your contract or in supplemental language found in agreements, disclosure documents, regulations or elsewhere which specifies mandatory Arbitration, you will be subject to Arbitration if either side requests it. Note, however, that both parties can agree to waive Arbitration and proceed directly to the Courtroom. Who interprets whether the Arbitration Clause found in my agreement to Arbitrate is mandatory? Generally speaking, the initial determination of whether a matter is subject to Arbitration is made by the designated Arbitrator or under limited circumstances by Judge who will decide whether the dispute is subject to binding Arbitration. What are some of the benefits and disadvantages of Voluntary Arbitration? Your question is very broad and would require many pages to answer. May I suggest that you go to the page in this cite entitled “Benefits and Disadvantages of New Jersey Arbitration” for a thorough listing of all of the pros and cons to New Jersey Arbitration.